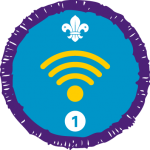 The Digital Citizen Staged Activity Badge can be achieved from Stage One through to Stage Four. The Digital Citizen Staged Activity Badge and the Digital Maker Staged Activity Badge involve performing some tasks online. Before young people undertake these activities they should be aware of the benefits and risks of being online.